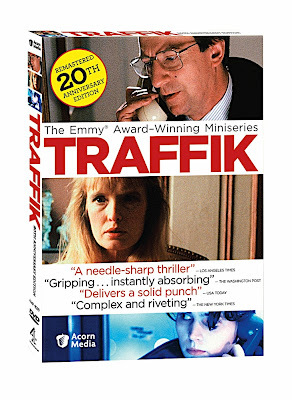 Since it's only been nine years since Steven Soderbergh's quadruple Oscar winning remake of the six episode miniseries Traffik was released in 2000, it'd be easy for most viewers to assume that the twenty year old original Channel 4 production would feel extremely dated by comparison to the gloss of the Soderbergh stunner. And admittedly from a technical standpoint, this prediction would prove to be accurate as overall time has not been kind to the print of the Alistair Reid helmed and Simon Moore penned epic, despite the remastered product delivered via this 2-disc Anniversary Edition of the '89 series that originally played in America on PBS' Masterpiece Theatre. However, the quantity in years has little to do with its undeniable quality as I was startled to discover that, instead of adhering to the same warning label to dispose of old medication after an annual fill date has passed, the scope, storyline, and impact of UK's Traffik has actually grown increasingly potent with each successive year. The award-winning and critically acclaimed miniseries was a masterfully ambitious undertaking in its desire to analyze as Moore stated, the drug trade as though one was studying the automotive industry to dismantle it piece by piece from inception to assembly line to end consumer. By illustrating the massive scale of the process along with bravely acknowledging that trying to rid the planet of drugs is an unrealistic goal and a war that can't be won, Traffik is a visceral experience that forces you to study the international epidemic in all stages around the globe. Instead of trying to get through to you in soundbytes, the filmmakers use the roughly three hundred minute running time to dynamic effect as you're pulled into identifying with individuals you seldom see in most filmed portrayals of the war on drugs that mostly dwell on police officers and junkies. Although the titles of the six episodes consist of "The Farmer," "The Addict," "The Criminal," "The Chemist," "The Politician," and "The Courier," our main ensemble cast of characters moves from one label to the next as they evolve, their plotlines change, and situations grow incredibly complicated. Thrust into a drug bust at the start of episode one, Traffik sets the events of the next several hours in motion as a seizure in Hamburg, Germany by undercover cops ties to a prominent businessman who makes a living allegedly eradicating drugs and helping to turn a new leaf for poppy farmers in Pakistan. Yet just moments later, we move back to one of those very farmers whose fields are burned in an effort the outside world views as progress as meanwhile and just before his aforementioned arrest, the same German businessman greets a British parliamentary officer studying the process on a fact finding mission. This continues until eventually we follow these and other individuals as the story grows but even when we're only in the presence of a single character, the bigger picture of every situation is always in view. It's never about just one farmer, one addict, or one police officer and the way the writer and editors manage to tie it all together makes Traffik not only one of the most forward thinking, intellectually stimulating, and influential miniseries of the twentieth century but also one that still resonates for viewers all the more in a post 9/11 world. This is especially apparent when the film's characters address American involvement in Afghanistan and Pakistan and the conflicting messages of different governmental agencies working against one another as one states that "America is never a problem if they're fighting themselves." It's a revealing line that hits us especially hard today and events in Traffik foreshadow not only our future problems with that region of the world but also the future of human drug smuggling as one sequence included was just echoed a few years ago in the Oscar nominated Mexican docudrama Maria Full of Grace. In other words, the movie from the past feels at times like we're looking in a mirror as the miniseries is filled with the earliest glimpses of situations we're currently facing today. In this regard, it's similar to the eerie experience of watching Mike Nichols' underrated and illuminating Charlie Wilson's War. However, whereas Charlie had the benefit of being both a true story and one made after 9/11 so that it could multiply the allegorical effect in hindsight, screenwriter Simon Moore's Traffik was an original work. Yet despite this distinction, Moore's work was rooted in enough truth that I'm awestruck that its impact on audiences in 1989 or 1990 (when it played in the United States) wasn't larger than being only used as Hollywood fodder a decade later. Similar to Soderbergh's decision to focus primarily on three intertwined stories set in various locations (within the United States and Mexico), Traffik's central structure chronicles a trio of interconnected plotlines as well. However, the former film manages to widen the lens to include a multitude of characters along with far more moral ambiguity in its emphasis on events that take place in Pakistan, Germany, and England. Yet, instead of making drugs just a device or risking that Traffik would simply feel like the "issue movie" of the week, the miniseries set itself apart by instead deciding to view the issue in terms of the people whose lives are affected by it. To this end, this gritty, unflinching, and deeply authentic work is filled with brilliant moral and ethical questions including the humanistic response that the best way to fight the situation is to try and remove the reasons people reach for the escapism of drugs in the first place. And while it never deludes itself into imagining a solution is within reach, the underlying thesis of Traffik is far more hard hitting by suggesting that to achieve this, global communication is needed to address social inequality, health care crises along with monitoring corruption from the highest levels of government on down. While obviously one couldn't cram this much plot into a theatrical running time, Steven Soderbergh's intelligent and truncated modern film was augmented by the clarity across the board from Stephen Gaghan's screenplay, sharp editing, and three strong and distinct visual palettes. In fact, the one area where Traffic greatly surpasses the original was in its artistic success in providing viewers with an immediate cinematographic shorthand to give us our bearings at any given moment in a way that Reid aspired but didn't quite achieve in the original as England and Germany blend together visually every once in awhile. Yet despite this one flaw which can undoubtedly be attributed to limited technology and budget in '89 UK television production, Reid's staggering achievement is further bolstered by Simon Moore's ingenious screenplay and an incredibly talented international cast. Moreover and especially in this slim-packaged restoration from Acorn, you'll find that Traffik hooks you with its first dose and continually addicts with side effects you can't help but crave in a work that's hard to shake, impossible to forget as a filmed experience you'll want to push onto others since you'll realize it's one you can't stop talking about.